It's really a shame how something so small can alter your mood. Last night, my team lost. I'm not happy about it. AND, it really bothers me that it affects me so very much. Please bear with me the next few days as I grapple with the loss and the moodiness that it seems to have brought. The boys of the Alabama Crimson Tide fought a good fight last night and win or lose they will ALWAYS be the best team in the land! What I have a harder time with is (and always seem to after a game like this), is the way other people want to kick fans while they are down. As if the bitter pill of loss isn't enough for a fan, the salt that is rubbed into the wound by supposed friends doesn't help. Seeking to purposely and personally hurt another's feelings when their heart is already low isn't cool, it's just cruel. I know it's a game and it may seem so silly to so many, but I put my passion in few things: my husband, my family & friends, my crafts, and Alabama football. Sigh. I've tried to figure it out for years why football is so important to me, and I think it has something to do with the men I've lost in my life. My father, my uncle, and my great-uncle were all die-hard fans who raised me. Watching the games ties me to them, gives me that connection, fills the hole that their deaths left. So when you attack Alabama football; you attack me, you attack my family, you mock my beliefs, and you disrespect the memory of those I've lost. It burns. Yes, it's just a game to you. To me, it's so much more. With that off my chest, let's get to some I Heart Macro Sunday. Since everyone seemed to enjoy the buttons I scored the other day, I thought I'd share some macro shots of just some of my buttons. These first two are from the thrifted ones. These wood buttons were a real score at $1 a package at Michael's. I can't wait to alter them! 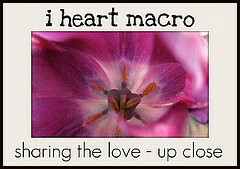 For more I Heart Macro Sunday, head over to Studio Waterstone. Thank you for allowing me to rant. Sometimes I find it best to get my feelings out in writing. Here's hoping you have a beautiful Sunday. I'm hoping to find some activities to take my mind off the game and soothe my soul. Hope, I complettly understand you when you talk about how crule some fans of other teams can be. My brother is the only Auburn fan in the five of us siblings and he could not wait to rub it in that Alabama lost. I look at it this way it was a good game and no touch downs were scored on either side and we only lost by three. When you put the two best teams in the southern US together one has to loose I'm just sorry that it was us. So here is a big ROLL TIDE to you my friend and remember, "We get knock down, but we get up again. Nothing is going to keep us down!" PS: love the button photos and can't wait to see what you do with the wooden ones. Oh Hope so sorry I can completely understand how it ties you to great memories of those you love XOXO I love those Micheals buttons too! So many possibilities! BREATHE and treat yourself to a weekend Margarita! I have such a button "thing" and I'm loving your buttons. I try to use them on most things I make. Chocolate usually soothes my soul! I truly hope your week is a good one! Sorry for all your loses, football and family. When we have things, activities, and places that we connect with memories of loved ones lost, we do feel things more keenly I think. I hope the sting passes soon. Regarding your buttons, I too have gathered up a few, purchased a few that I thought were really unique, but can't figure out what to do with them in terms of making jewelry--which is my intent. So I'll be watching to see what you make with yours! Meanwhile, interesting macro all on their own! LOVE the buttons! I am a button fiend also. can't have too many buttons, or purses, or pens, or jewelry tools, or...well, you get the idea. sorry about your team. Thanks! I definitely know the feeling of being a collector too. I totally get the idea. Thanks also for the condolences. I completely understand. That was the most heart-pounding, gut-wrenching, nerve-wracking three and a half hours I've spent in a long, long time. When we lived in Tuscaloosa, if we weren't at the game, we'd all be huddled in front of the television, running to open the back door to hear the roar of the crowd come over the Black Warrior when the Tide scored. When we moved away, watching the games as a family connected us to our former home. Last night, I was the only one home, but we "watched" together and texted udpates. Dang, I wanted to hear Rammer Jammer, but Roll Tide always! I love wooden buttons, always have. A good find with lots of possibilities. Oh, yummy shots of those cool buttons! And I certainly understand that football is so much more than a game...my dad played D1 - as did my brother...it's a lifestyle, no doubt about that! Love love buttons! You have fantastic shots here too. Happy Monday! I'm so glad you like the pictures. What a wonderful assortment of fun buttons! As for the game...well, I am watching NFL Monday Night Football. My team, the Bears, are playing and winning, but all too fast, that can change. Sorry to hear that Crimson lost. THANKS!! I do love my buttons so very much. I saw that your Bears won last night, and really fought for that win. Congrats! And, thanks for the kind words. They are much appreciated.